Hazmat situations occur all over the country. Improper hazmat storage can create dangerous environments for personnel, as well as the environment. That’s why anyone who regularly stores, processes, and handles hazardous materials should have a safe, compliant hazmat storage building. 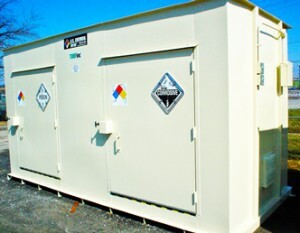 Your hazmat storage building should be designed to address hazards associated with your hazardous material. It’s easy when your storage building is fully customizable – you’re able to select from a number of accessories designed with the highest safety standards to maintain your hazmat storage and create a safe storage environment. Your flammable materials should be segregated from oxidizers and other incompatible materials to avoid dangerous chemical reactions and stored in fire-rated storage buildings for increased protection. Additionally, all flammable storage should be equipped with fire suppression systems appropriate to the hazardous material within. Proper signage can alert personnel and visitors of the fire hazard, and sources of ignition should be kept separately from your flammable storage. Corrosive materials storage should be designed to ensure the safety of your personnel. Storage safety starts with ensuring easy, efficient access to chemical containers, and walkways should be free of obstruction. This minimizes the risk of personnel tipping chemical containers. Additionally, personal safety accessories such as eyewash and shower stations should allow personnel to quickly rinse hazardous materials from the skin and face. If your corrosive materials are capable of fuming, mechanical ventilation can reduce inhalation hazards. Your explosive hazmat storage building can be equipped with explosion relief construction, designed to withstand internal pressures and cushion panel acceleration, should an explosion occur. Pesticide storage should adhere to federal, state, and local regulations for total safety. Preventing pesticides from entering water sources, including groundwater, is essential for the health of the wildlife and community. As always, it is important to segregate incompatible materials. Not doing so could result in dangerous chemical reactions within your hazmat storage building. Depending on your hazardous material, you may want or need to equip your hazmat storage building with any number of accessories. These accessories are designed and built to mitigate hazards within your hazmat storage building. Certain accessories such as racks, ramps, and shelving are built to facilitate the hazmat storage process while providing unmatched strength and support.